There are many types of diversity—or diversity opportunities—in today’s organizations. HR teams are presented with several considerations when they dig into diversity at their organizations. 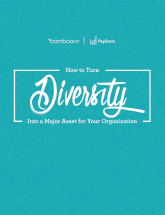 This eBook covers all the relevant aspects of diversity in the workplace, and details how you can stay on top of each one to make diversity a significant asset at your organization.